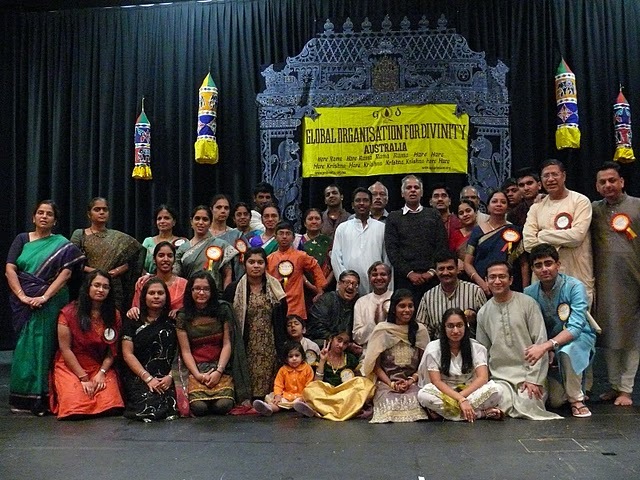 Simple, Sweet and Rare was the chant of the volunteers of Global Organisation for Divinity [GOD] who worked hard last weekend putting a successful show at the Bahai Centre Sydney filling the hall. The first half of the programme comprised of popular bhajans and songs sung by Uma and Mythili Ayyar, sisters, accompanied by R Narayan on the Mridangam. The sound system was good. There was audience participation, thanks to some evergreen & popular Bhajans. What took the audiences by delight was the production of Namami Narayanam by Padma Balakumar and her students from the Nrityagriha School of Dance. 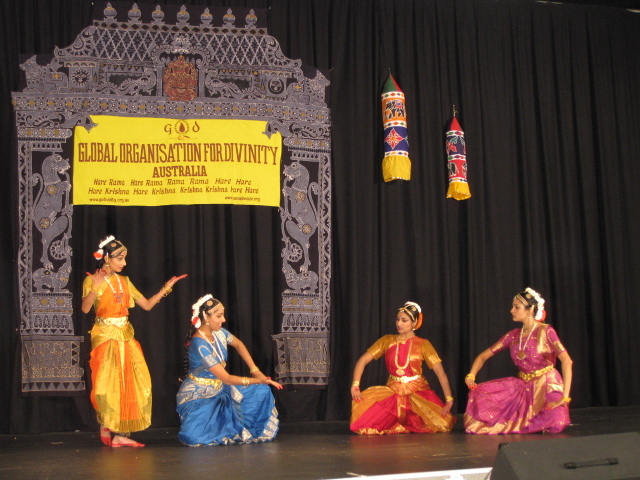 The dance production divided in three segments depicted Lord Narayana, Rama and Krishna. Stories of each of the deities were brought a full circle by the students of Nrityagriha School of Indian Classical Dance. The opening piece Narayana Kavuthuvam in Ragam Nattai started off with the slokam “Santhakaaram Bhujagasayanam” with Padma Balakumar holding a sculpturistic pose of Lord Vishnu lying down. 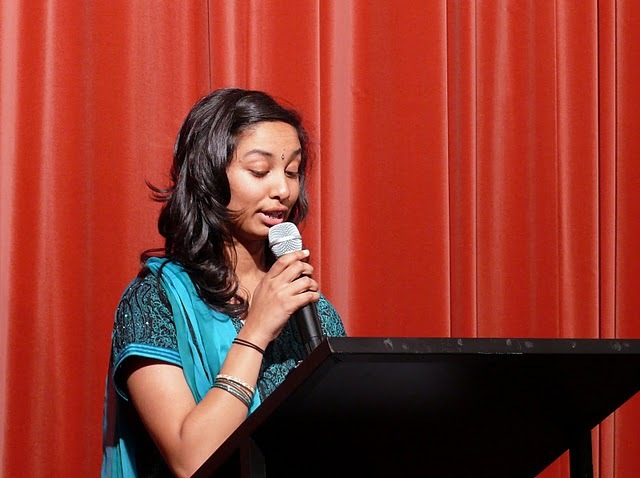 ‘Ivan Yaro’, a composition of Kavi Kunjara Bharathi, was a solo number performed by Padma. Delightfully choreographed it was executed with expressive nuances and wonderful eye catching sculpturistic poses. 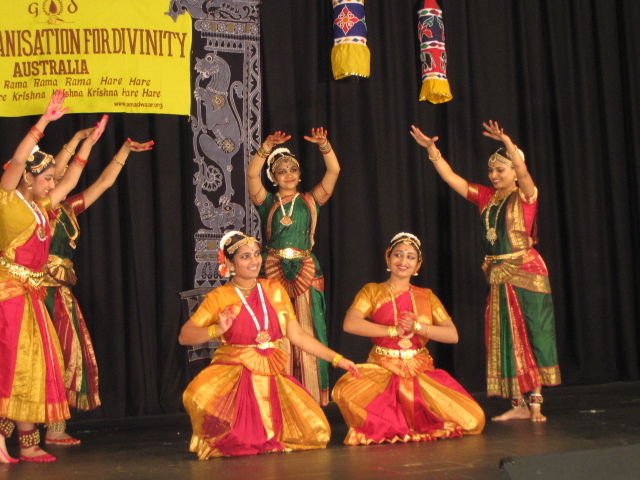 The students who danced to Sriman Narayana did justice by depicting Narayana and the lotus in full bloom. The duo Malavika Srinath with Bhavya Bharadwaj were synchronised in their footwork with hand eye movements which were completed to perfection in “En Pallikondeer Iya”, a compositon of Arunachala Kavirayar. The artistic depiction of the two dancers was impressive. Shruti Nathani and Sruthi Ravi, depicted their respective sections in various dances noticeably with grace. In “Jaganmohanane Krishna” the three senior dancers, Malavika, Bhavya and Sruthi, showed various stories including that of Yashoda and Krishna, Vamana Avatharam and the story of Badhmasura. Beautifully danced with synchronised movements and bhava the dancers engaged with their audience. The story of Badhmasura and his royal seduction in the hands of Mohini made an interesting portrayal with vibrant colourful costumes and expressive portrayal by them. 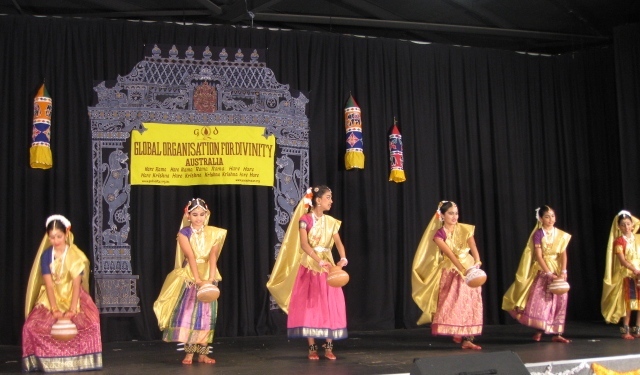 The other stories danced by the senior group were Narasimha Avatharam and Dhraupadi Vasthrabaranam followed by a crisp Thillana in Brindavana Saranga beginning with a virutham Adharam Madhuram. 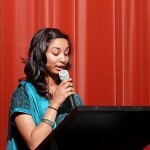 The entire production was well paced and kept the interest of the viewers alive. However what stole hearts and set the mood was the participation of the little one’s in ‘Vishama Kaara Kannan’ in the awesome wonderful voice of Prema Ananthakrishnan accompanied by Mridangam of Bala Sankar and Violin of Balaji Jagannathan. The cute depiction of little naughty krishna by the youngest group of dancers stole the show bringing smiles and laughs from the audience. 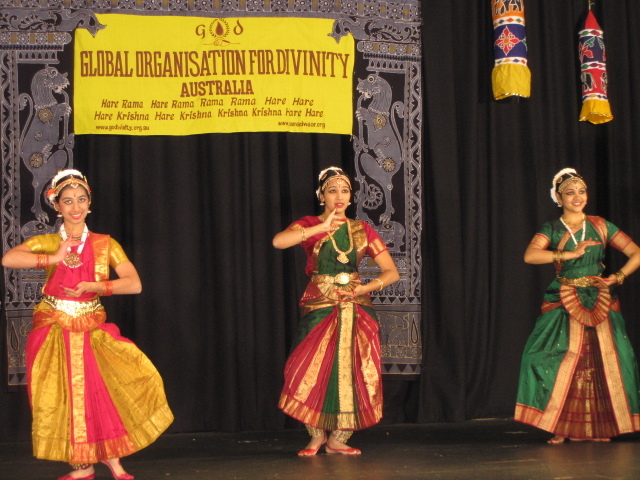 Nrityagriha School of Dance is well on the way to building a good group of dancers with a developed understanding of Bharathanatyam in Sydney with the support of their families and organisations such as GOD.